Keepsake memory boxes are a great way to collect into one place all those little tokens, trinkets, and treasures you want to keep to remember your loved one. 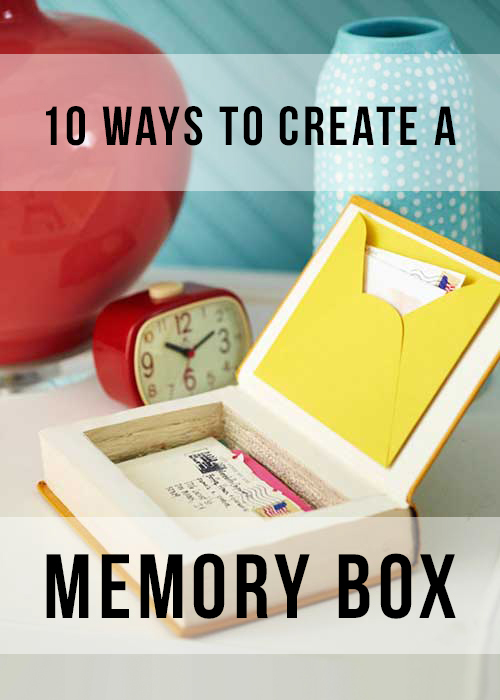 There are tons of options out there (you could spend days just browsing the memory box collection on Etsy), so we thought it would be helpful to list our favorite 10 ways to create a unique keepsake memory box in honor of your dearly beloved. 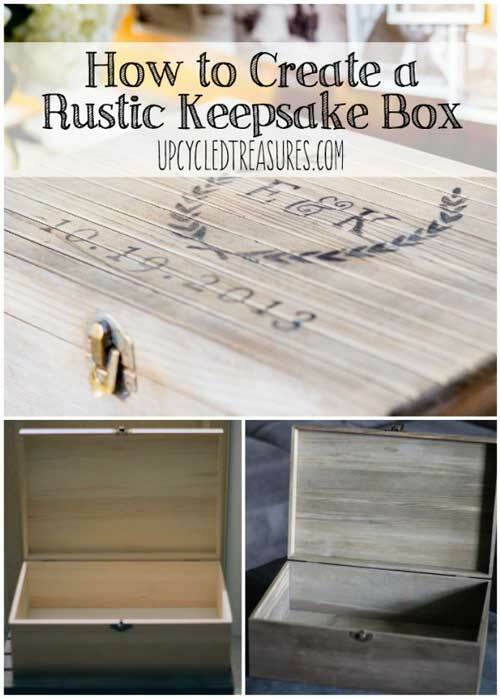 The list below includes our very own Custom Keepsake Box, urn and memory chest combos, the very best DIY tutorials, and other inspiring ideas for keepsake storage in memorial boxes. This tutorial from Upcycled Treasures shows you how to take a simple, affordable Hobby Lobby/Michael’s/Craft Warehouse type wood box and transform it into a timeless memorial. Includes instructions on how to transfer the personlization onto the lid using just your own printer and everyday craft accessories. For the avid reader, try making your own book-shaped memory box using an old or a favorite book. Cut out the pages, Mod Podge the remaining pages together, maybe add an envelope as pictured above to the lid/cover, and viola! a reader-friendly keepsake memory chest made from a book. 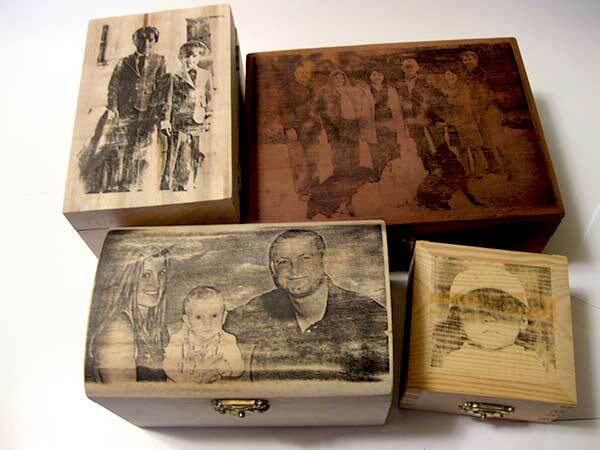 Transferring a photo onto a wooden keepsake box is a simple and affordable way to personalize your memory box. Tutorial and examples here. 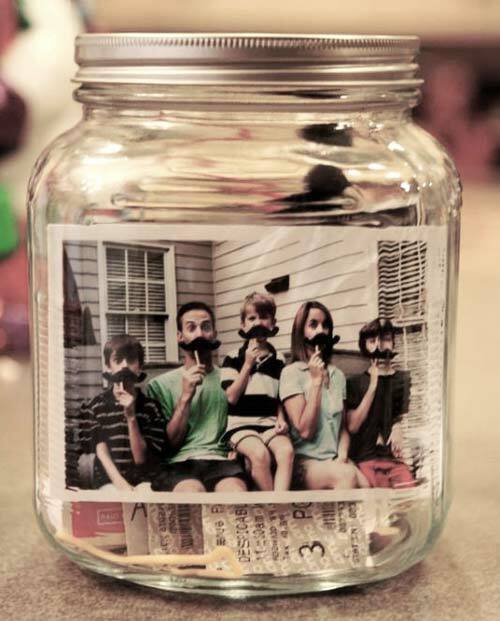 Celebrate your loved one’s life through photos in this sweetly arranged photo memory box. 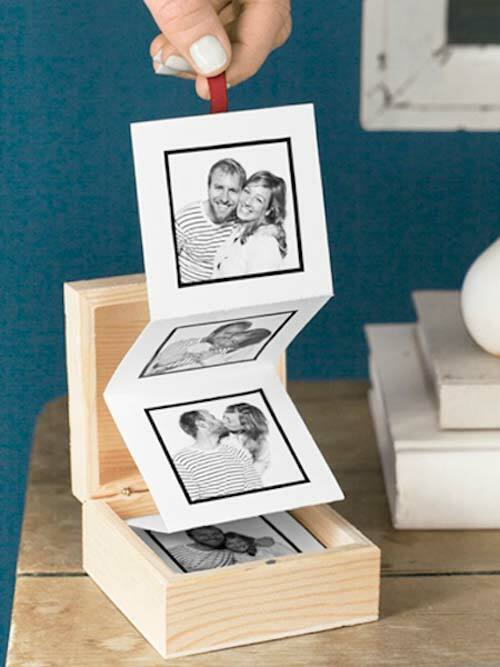 All you need is a small keepsake box, card stock, and small prints of your favorite photos. Instructions here. Kids need to grieve, mourn, and remember just like anyone else. 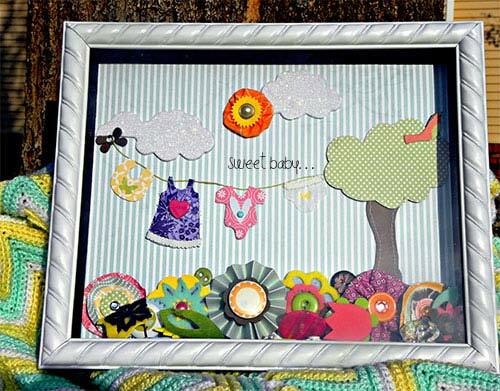 Help the little ones get involved with remembering a departed loved one by helping them create their own memory box shadowbox made from dollar-store picture frames and other embellishments. Fill it with drawings, cutouts, and keepsakes. Tutorial here. 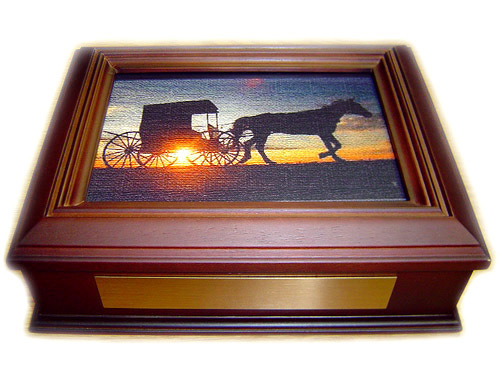 The Custom Keepsake Box is our top-selling memorial gift item. 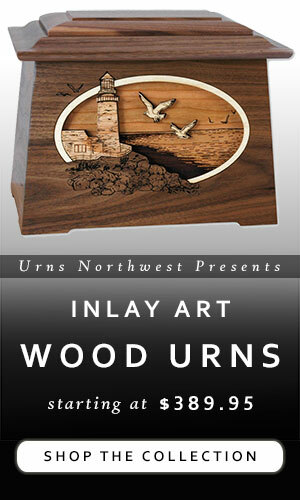 Made in the USA from solid premium walnut wood, the interior is a spacious 8″ x 6″ x 2″ high. The hinged lid features a frame surrounding a glass panel, which allows you to either see into the box or insert a card or photograph. The front nameplate is laser etched with name, dates, or any other inscription. Available here. 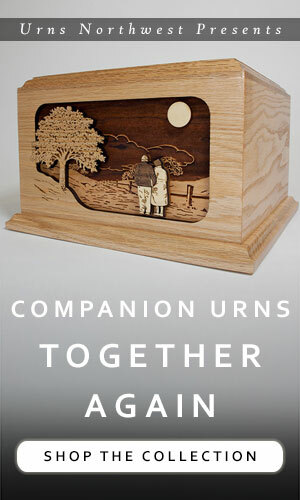 This lovely cherry keepsake box is a combination memory chest and cremation urn, with the top third being the keepsake area and the lower two thirds housing the remains. The hinged lid opens to reveal a 1-1/2″ deep memory chest area, which is spacious enough to hold letter, photos, jewelry, and more. The lower urn section is accessed by a bottom panel which attaches with screws, keeping the remains safe and secure. 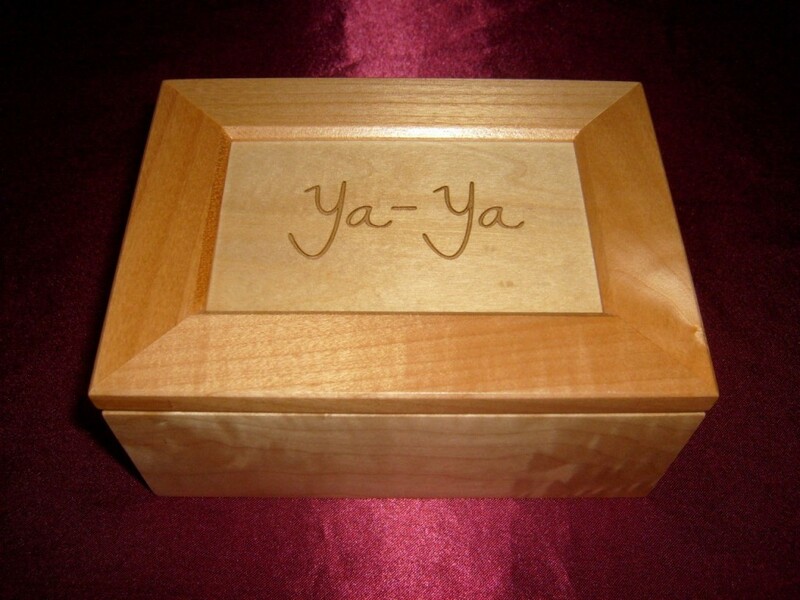 Made in the USA from premium stained cherry wood with an elegant engraved border design, the Memory Chest & Urn Combo is a beautiful memorial tribute with all-in-one functionality and can be personalized with custom laser engraving of name, dates, etc. 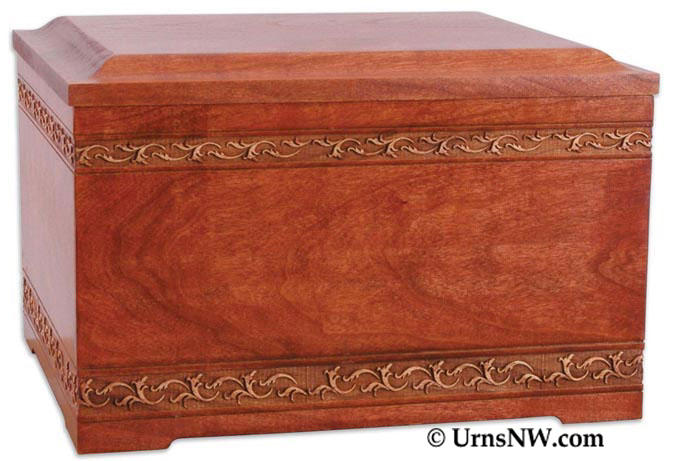 This military keepsake memory box is handcrafted in Oregon from solid wood, in your choice of walnut with rosewood stain (pictured) or oak wood. 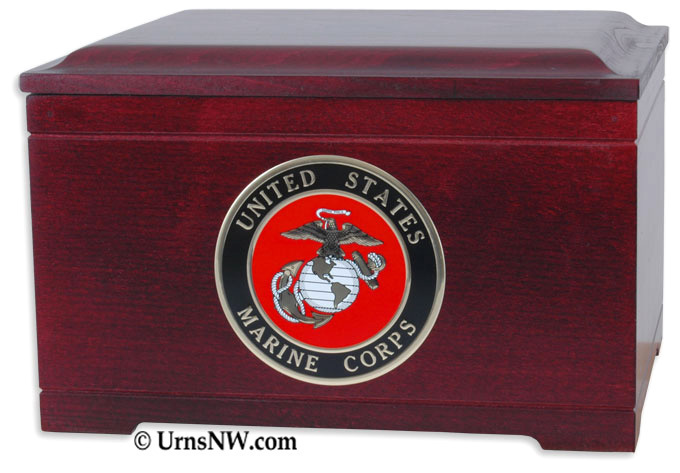 The large keepsake chest features a hinged lid, felt lining, spacious interior, elegant woodworking accents, and the military emblem for the branch in which your loved one served. Available here, complete with optional personalized surface engraving. An alternative military memory chest is our Chippendale Chest, which boasts a richly laquered “Piano Wood Finish,” lock and key, portrait frame and cushioned lid interior in which to pin medals, plus more. 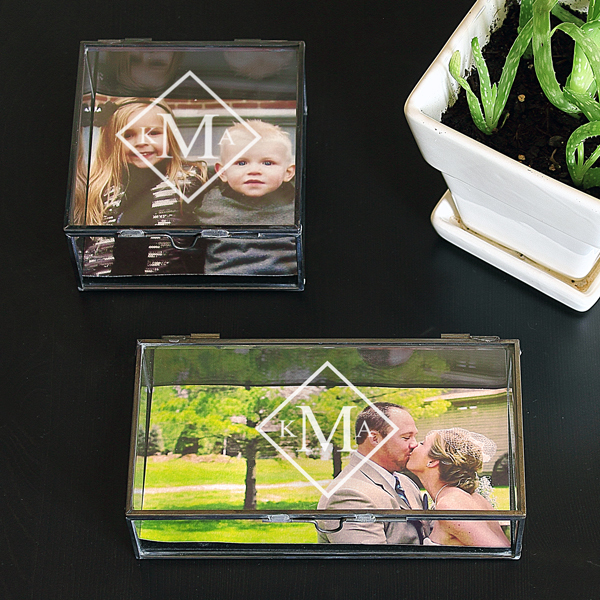 Affordably priced for any budget, the Glass Photo Keepsake Box is available in square and rectangle shapes, includes laser etched monogram initials, and is perfectly designed for a photo print to line the bottom. The elegance and sophistication of the glass memory box, combined with budget-friendly price tag and free personalization, make this an ideal gift to honor the memory of a loved one. The Personalized Budget Memory Box is made from solid maple wood and includes custom laser etching of any text, logo, or image onto the lid. A simple, affordable keepsake memory box with a full range of personalization, available here. Include photos. Photos are a beautiful tool for remembering special times together, the way they looked, pivotal events in your lives, and more. You can put small photo albums into many keepsake boxes, or get specially designed memory chest and photo album sets. Engrave or print a photo onto the lid (see above ideas), or use your craft skills to add a photo print to the top or underside of the lid. Fill the interior with prints, but if you do it’s probably a good idea to put them in some sort of protection, a slip case, the package they come in from your photo printing source, or even just a plastic bag. Capture their personality. Were they fun loving and boisterous? Were they quiet and contemplative? Did they love to cook? Collect baseball cards? 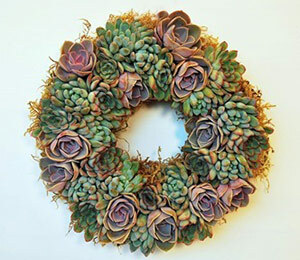 Garden? Include big things (military service, religious beliefs, children) and little (receipt from your favorite place to eat together, a note from a packed lunch, a movie ticket) that help capture their personality and your relationship together. Include the details. Birth certificate, marriage license, drivers license, employee ID cards or name tags – just because they’re everyday items doesn’t mean they don’t have value. Even if there is little or no emotional significance for you (or if it is so major you know you’ll never forget, like an anniversary), it’s still worthwhile to preserve things like the dates of special accomplishments, track records from high school, etc. Include a notebook or printout of all the important events – their first job, your first date together, special anniversaries, day you bought your home, children’s birthdays, adoption days, and so on. Make it for you. The memory box is about your loved one, but it’s for you. 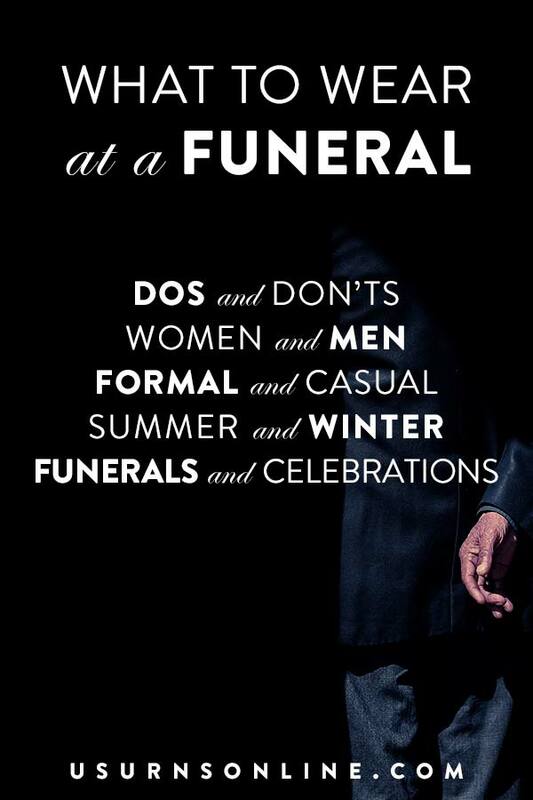 Keep that in mind when you’re selecting a box, personalizing it, and adding trinkets and keepsakes. What memories do you want to hold on to? What items or notes have special significance to you? What photos best help you remember your loved one? Add a pocket. 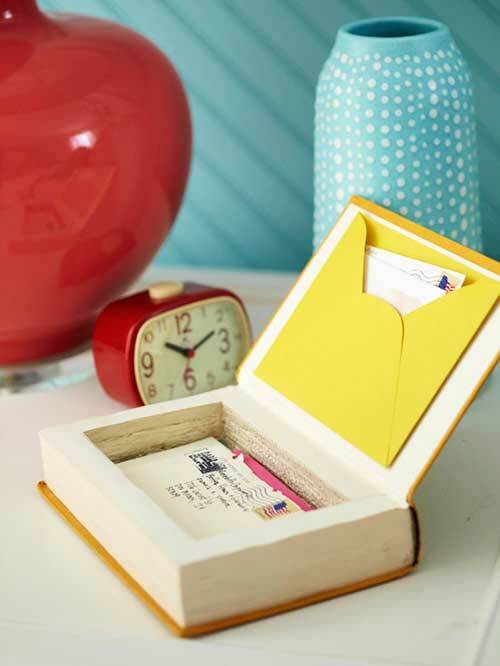 Glue an envelope to the inside of the lid to hold special notes or photos. Keep it nearby. If it’s tucked away in a closet somewhere, it could become a chore to pull it out. 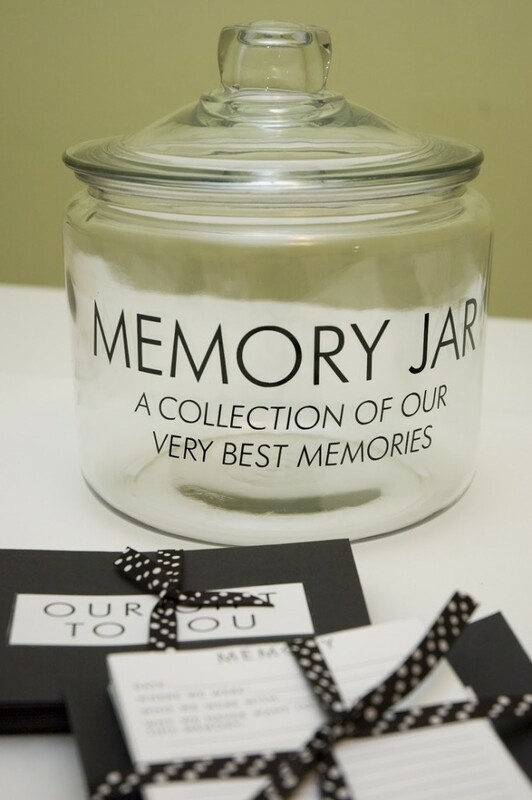 Leave it out in the open where it can stir your memory just by looking at it, and make it easily accessible so you can share those memories in your quiet moments by yourself, or with children and grandchildren to help them remember. More tips: gem.org has a nice PDF on making, filling, storing, and sharing your memory box.